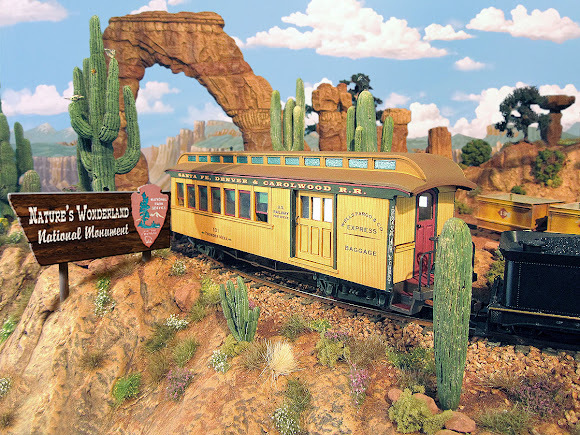 Engine #5, the Ollie Johnston, eases a train out onto Geyser Gulch trestle as the last rays of the setting sun illuminate McKennon Arch and an ancient Utah Juniper. 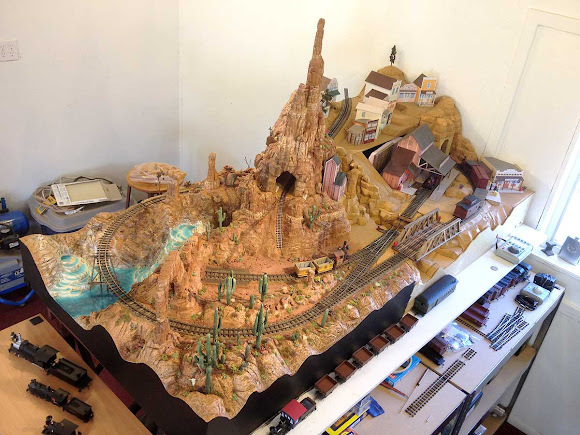 Even though it is based largly on an amusment park attraction, I still want Thunder Mesa to have a true Canyon Country feel. To that end, I've done a lot of research into the geology, wildlife and flora of the high desert Four Corners region where my mythical little railroad might once have existed. It's a unique region of bitter cold winters and blistering hot summers. A dry place where, if it rains at all, it comes all at once, filling every wash and arroyo with a flood of red mud. Things have to be hardy to survive around here and among the hardiest is the gnarled and twisted Juniper. I have to admit that Junipers, ofttimes called ceders by the early Mormon settlers, are my absolute favorite kind of trees. 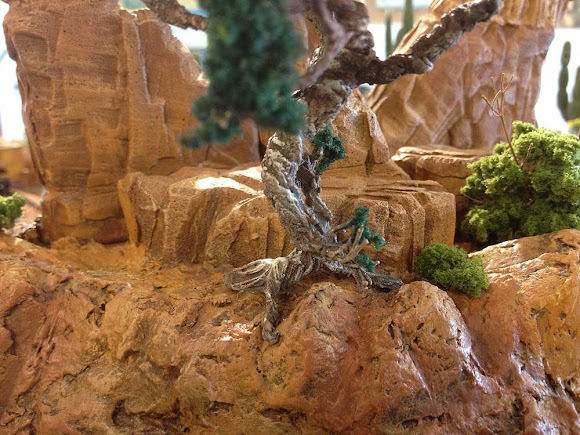 They can live a thousand years or more, eking out a humble existence on the mesa tops, hills and canyon rims; sometimes taking root in solid rock, cracking and breaking it with their spreading roots. They don't get very big, a tall Juniper might be 20 feet, but they do develop an enormous amount of character during their long and difficult lives, and anything with that kind of character is just begging to be modeled. 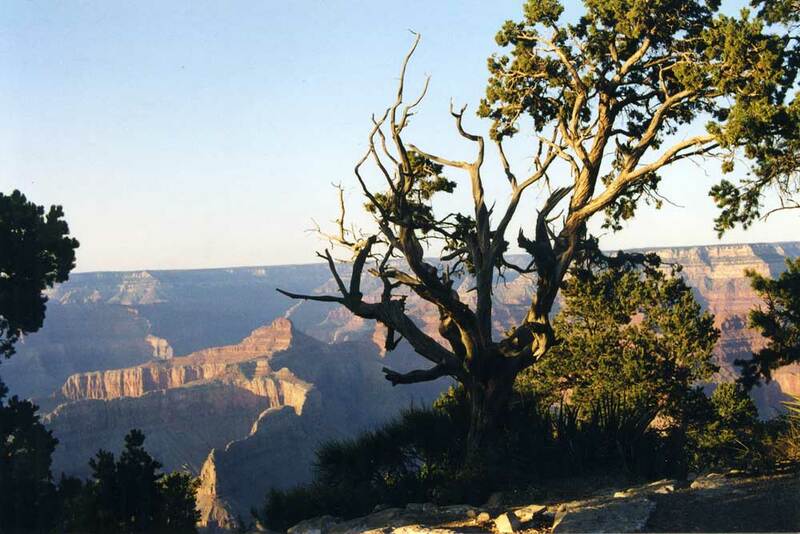 A Utah Juniper, clinging to the rim of Grand Canyon near Hermit's Rest. 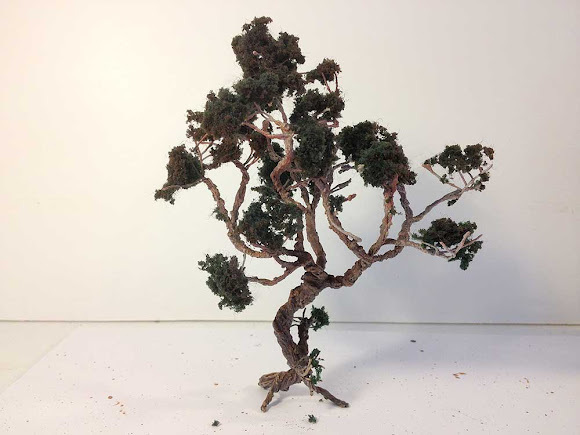 I'll be needing quite a few twisted and gnarly old Junipers for Thunder Mesa and there are no commercial products available that look anything like them. 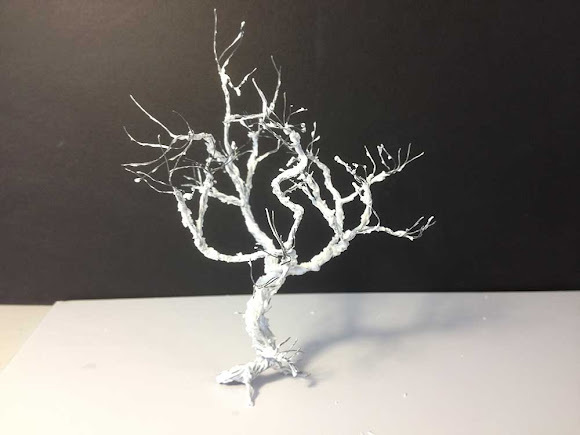 What follows is a quick tutorial on the techniques I use for crafting these trees quickly and relatively simply. I hope some readers may find it useful. Note that it is just as easy to make several trees at one time as it is to make one, but for the sake of clarity I'll only be showing the construction of a single tree. Braided steel picture wire (the uncoated kind). Acrylic modeling paste. I use Liquitex but any brand will probably do. Krylon spray paint: Gray Primer, Red Primer, Flat Ivory. Acrylic paint: Burnt Umber, Unbleached Titanium. Woodland Scenics (or other) Dark Green Foliage. 3M 45 All Purpose Spray Adhesive. 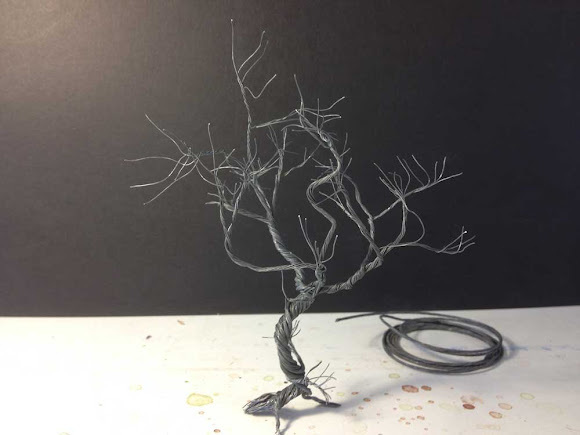 Step #1: Using photos as a guide, I build an armature from twisted picture wire. This armature used about ten strands and was twisted and shaped with needle-nose pliers into a tree about 20 scale feet high. 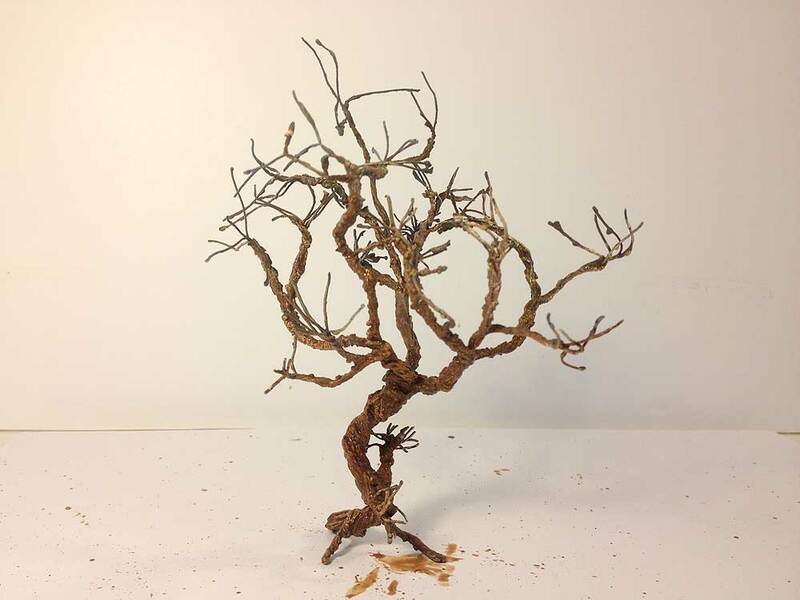 I separate the individual strands of wire at the end of each limb to represent branches. Don't forget the roots! Step #2: Next, I paint the whole thing with Liquitex Acrylic Modeling Paste, taking car to leave the ends of the branches thin and bare. I apply it pretty goopy, hiding and then revealing the twisted wire. This does a fairly good job of representing the dead and living parts of the tree that exist side by side in nature. I let this dry completely before continuing. Step #4: A wash of Burnt Umber acrylics, leaving a bit of the gray to show through here and there. Let that dry. 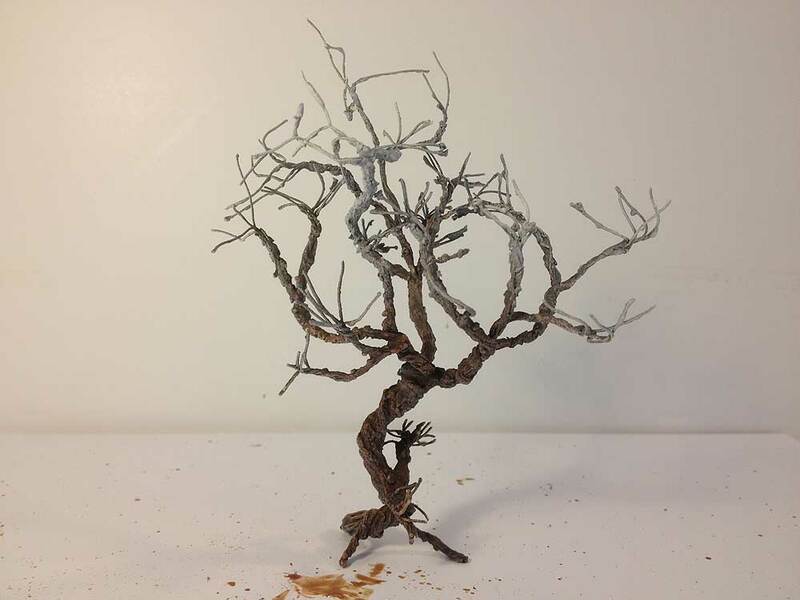 Step #5: Once the brown is dry, I give the ends of the branches a light overspray with the Krylon Ivory. This is an important step as it creates contrast when the foliage is added and adds a bit of old age to the tree. If I overdo it, I go back and tone things down with more Burnt Umber. Step #6: Next I spray the ends of the branches with the 3M adhesive, taking care not to get too much on the trunk. Then it's a simple matter to apply the clumps of Woodland Scenics foliage here and there, once again using photos for a guide. Step #7: Using Unbleached Titanium, I now carefully dry-brush some highlights onto the trunk and roots to bring out the detail. Again, if this gets overdone, it's easy to tone it down with another wash of Burnt Umber. 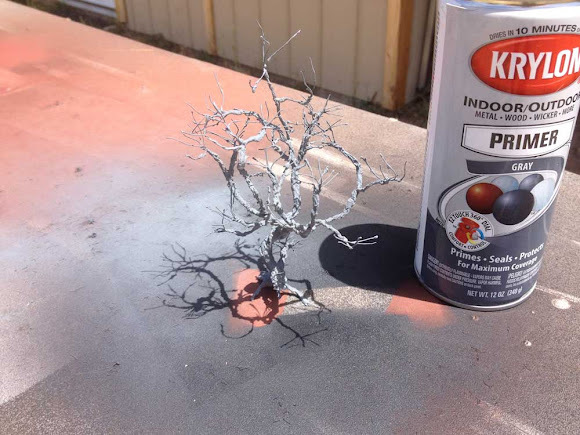 Step #8: Finally, I give the foliage on the top of the tree a very light overspray with the Krylon Red Primer. This tones down the color of the foliage, which is just a little too blue, and also creates the illusion of Juniper pollen, something these tress are often covered with in the spring. 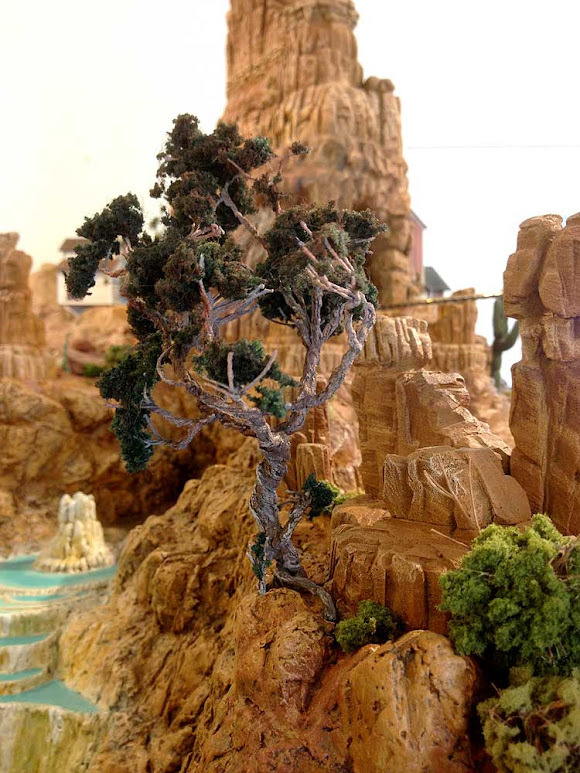 And there you have it, an ancient desert evergreen clinging to the cliffside. Now I'm off to make more trees. Adios for now! A lot has been accomplished on the layout over the last month, new sections of scenery have been completed while other projects remain on hold, waiting for materials to arrive. The most obvious changes since last month involve the scenery around Geyser Gulch and a change in track gauge on the Calico High Line. 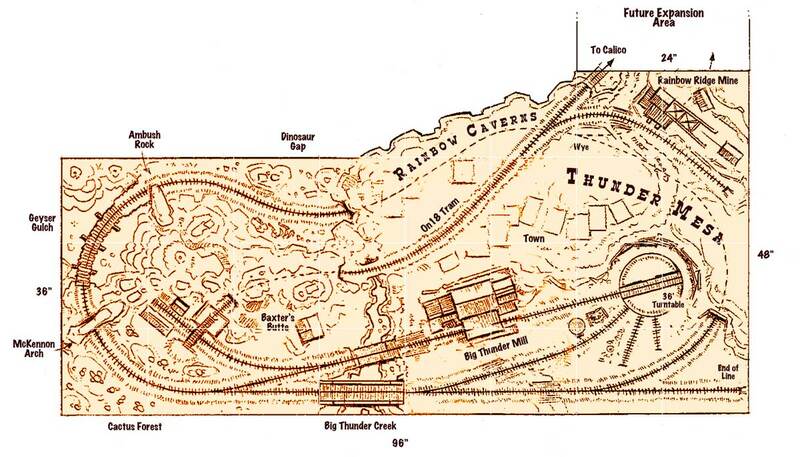 This track now represents an On18 mining tram (O scale trains running on 9mm N gauge track = On18) that will connect to a Calico Mine Train themed section when the layout is expanded. And speaking of expansion, another obvious change is the workshop area behind the layout has now been cleared out to make room for more railroad! Soon, the layout will expand from its current 3'x6' footprint to something closer to 4'x8'. This small change will greatly expand the TMMC's operating potential while setting the stage for a major expansion that will take the layout around the walls of the studio in the future. Thunder Mesa is getting bigger! The addition of a turntable, runaround track and small yard at Thunder Mesa turns this section into the way-out-in-the-boonies, end-of-the-line mining town it was always meant to be. It can still be operated as a caboose chaser, but the addition of a wye switch inside the Caverns will take the true mainline to a small staging area that will serve as "points beyond" in point to point operation until the layout is complete. As a bonus, Rainbow Caverns also gets bigger and the On18 Calico line will have a new mine to serve at Rainbow Ridge. This should be fun. Stay tuned!